The title, the author, the disclaimers. Now we know she is a real person. Her name isn’t Sundberg but she has been involved with Prairie Home Companion for years, and she has a cookbook out. Posted in food writers, not about food and tagged Mrs. Sundberg, not about food. Bookmark the permalink. 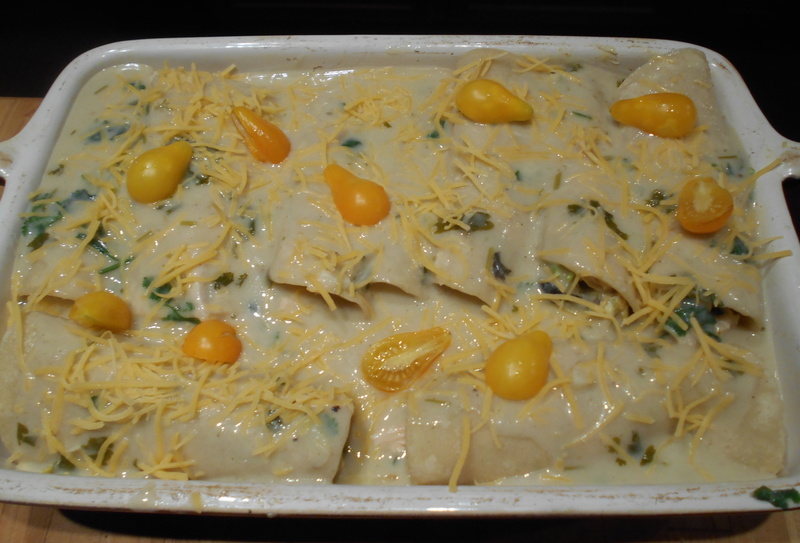 The first enchiladas I ever made were from the Sunset Cook Book of Favorite Recipes. The recipe called for 2 cups of sour cream and 1 pound of shredded Cheddar cheese plus additional sour cream to pile on each serving (and this was in the days long before there was such a thing as nonfat sour cream or low-fat cheese). I made it quite often for years. It was wildly popular among my co-workers when I brought it to potlucks. Between this and the cheesecakes I used to make, I probably single-handedly contributed to the early demise of of several people. But we’re here now in the Dark Days Of High Cholesterol, so I needed to find a way to make luscious enchiladas without so much animal fat. 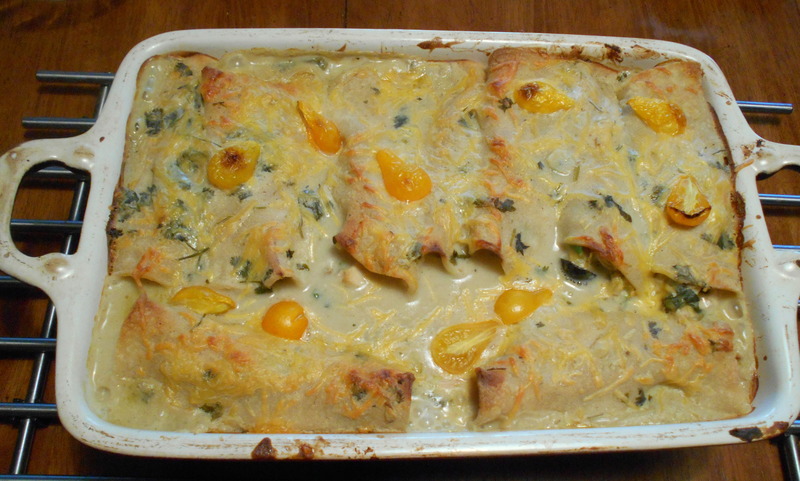 Someone on Facebook – I have forgotten who, so I can’t give credit – posted a recipe for chicken-avocado enchiladas that looked pretty good. I messed around with the recipe a little, then called friends to come over for dinner. None of us could stop eating it. We cleaned the pan out. I’m telling you, this is good. If you must, you can substitute canned green enchilada sauce, but this sauce is totally worth making. 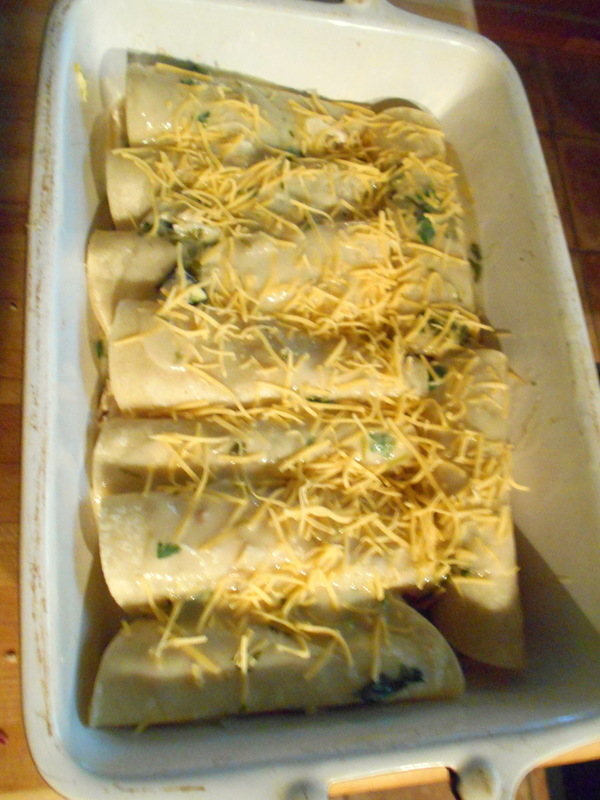 Both the sauce and filling can be made a day ahead if necessary,but do not add the avocados until ready to assemble the enchiladas. 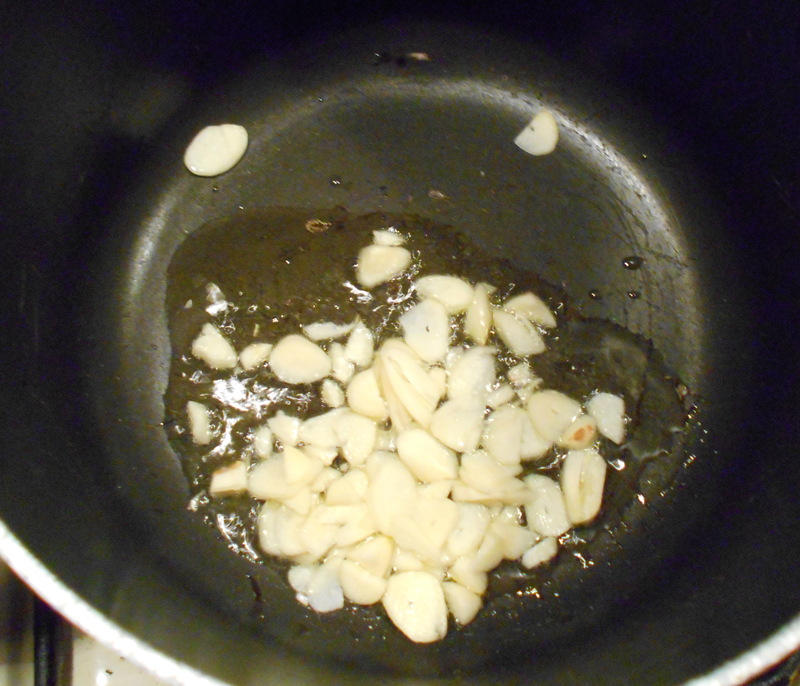 Heat the oil in a saucepan and saute the garlic lightly for a minute. Do not allow garlic to brown. Stir in the flour, and cook & stir over medium-low heat for 2 more minutes. 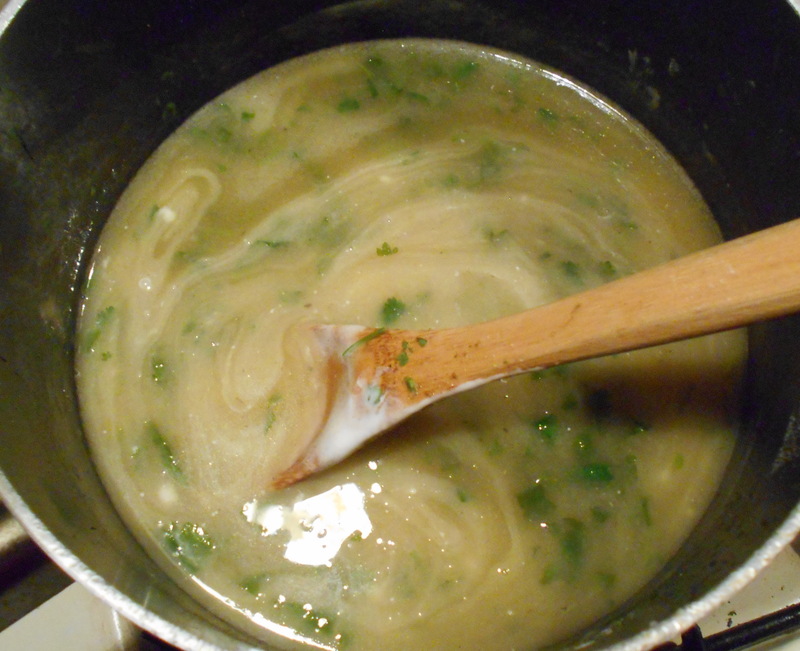 Add the chicken stock while stirring, and keep stirring until the sauce is lump-free. Add the cumin, salt, pepper, and salsa verde, and heat until thickened (it won’t be really thick – about the consistency of canned enchilada sauce). Taste and adjust seasoning with more salt, pepper, or cumin as needed. Add the cilantro. When sauce tastes good, remove from heat and stir in the sour cream. Do not boil sauce after sour cream has been added. Heat 1/2″ oil in small frying pan. 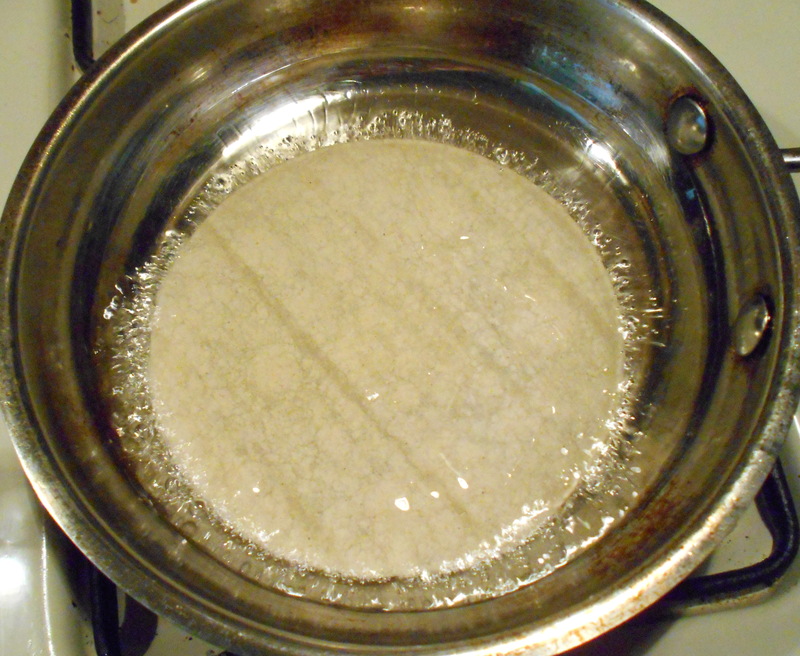 Test by dipping the edge of a tortilla into the oil. If the oil sizzles, it’s ready. Fry each tortilla for about 5 seconds on each side. Do not try to crisp the tortillas; this step is to soften them. Turn with tongs, then remove to a plate lined with paper towels, and press the tortillas between the towels to absorb excess oil. Use as many paper towels as needed – I arrange about 3 tortillas on each towel, then top with another layer of towels. Combine all ingredients except cheese, using as much sour cream as necessary to coat everything. Mix gently to avoid mashing the avocados. Spread about 1/2 cup sauce on the bottom of a large baking dish. Fill each tortilla with equal amounts of filling – for this much filling/this many 6″ tortillas, figure around 1/3 to 1/2 cup filling, but YMMV. 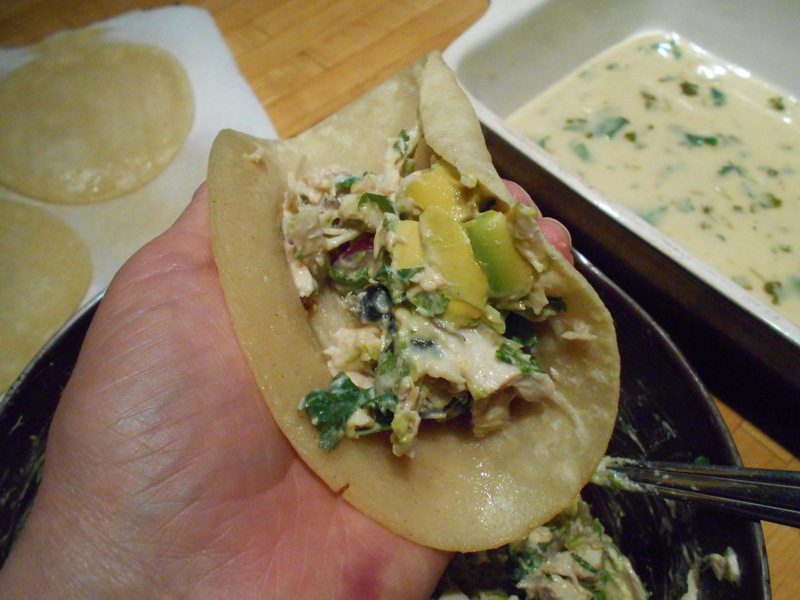 Tuck each tortilla into the baking dish, open side down. Here I decided to make a double layer of enchiladas, so when the baking dish had one full layer, I poured some sauce over the first batch and sprinkled with about 1/4 cup shredded cheese. Or just make one layer if the baking dish is large enough. Second layer – pour the remaining sauce over, top with about 1/4 cup cheese. If you like, top with sliced tomatoes, roasted red bell peppers, chopped olives, sliced avocado, etc. Bake at 350 until hot and bubbling, about 25-30 minutes. Serve this with beans – I made plain boiled pinto beans served in little bowls with cilantro and chopped red onion – rice, and a green salad. Saute garlic in oil, then add broth, salsa verde, and seasonings. 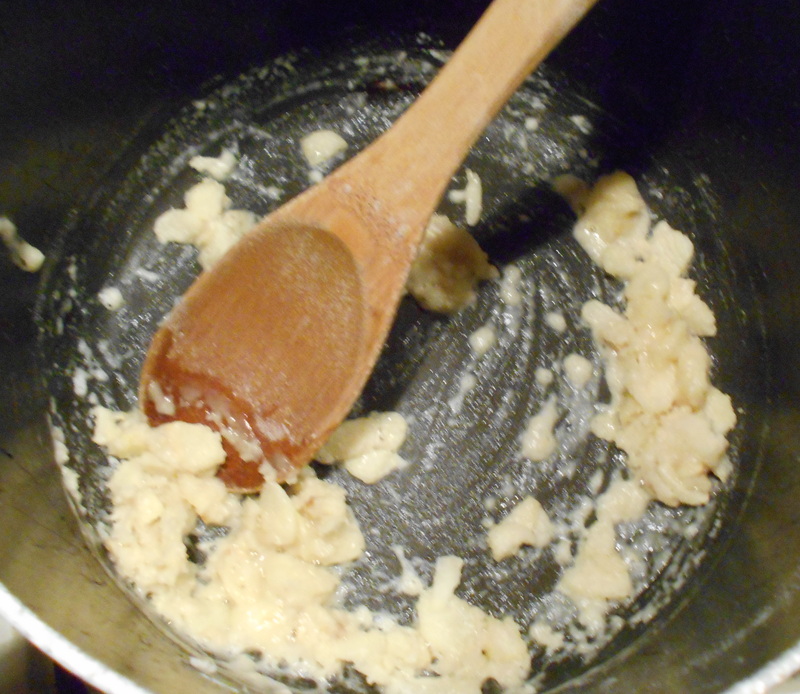 Thicken with a cornstarch slurry – when sauce is thickened, add sour cream and proceed with recipe from there. 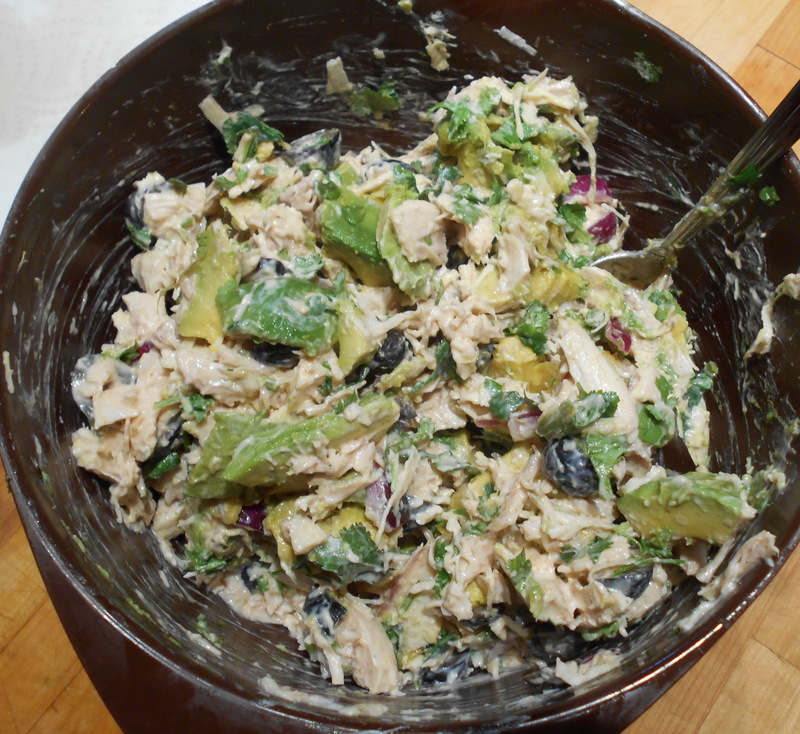 Posted in recipe and tagged avocados, chicken, enchiladas, gluten free, Mexican. Bookmark the permalink.